In this game, Grandma Grouper's treasure chest of kelp seeds are stolen, and Freddi and Luther go off in search of the thieves, who turn out to be two sharks (One is called Spongehead but the other is never called anything but Boss). Thankfully Spongehead has a bad memory so he left a trail of notes in bottles leading to the chest. This game, as well as its subsequent titles, won several awards upon release. 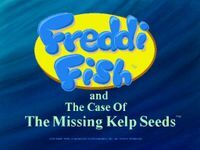 It is now a Wii game, too, known as Freddi Fish in Kelp Seed Mystery. Source: Wikipedia, "Freddi Fish", available under the CC-BY-SA License.